Lab-grown meat’s (LGM) main draw is that it bypasses the need for animal slaughter for meat production. Critics argue that it reinforces speciesism. LGM only requires an initial stem cell sample found within muscular tissue retrieved from livestock. The stem cells are then grown in culture to form muscle fibres, which can be cooked to deliver an equivalent meat product. The various pharmaceutical cocktails fed to agricultural livestock for disease prevention and rapid mass gain is contributing to the rise of antibiotic resistant bacteria known as ‘superbugs’. A worst-case consequentialist approach supports that humans should take action before ‘superbugs’ constitute a global health crisis becoming more difficult to kill with the rate of bacterial immunity outpacing new pharmaceutical cures. Consequentialism supports switching to antibiotic free LGM to prevent the ‘superbug’ scenario materialising. Notwithstanding ethical egoist arguments in favour of LGM as a cleaner meat product free from chemical injections and artificial hormones compared to conventional meat. Tackling rising resource scarcity is a major challenge facing this generation especially as the population is predicted to rise to 10 billion by 2050. Deontological ethics supports that it is our moral obligation to switch to LGM which requires less than 5% land (figure 1). Some deontologists regard natural resources as sacred, therefore supporting the switch to the most sustainable method of meat production. Former agricultural land freed by LGM could then be used for wildlife preservation or to tackle impoverishment, which is seen as the moral choice when viewed through a land ethics framework. Similarly, strict egalitarianism supports switching to LGM as it ensures that the next generation are allocated similar resources. Approximately 150 million animals killed every day to provide food, many have lived their lives in squalid conditions such as battery pens. This prioritises efficiency over animal welfare. Meat-eaters cannot deny the path of animal suffering, which belies the current industry. Virtue ethicists argue that for a diet that is considered non-essential such as meat, the subsequent animal suffering is therefore unnecessary and opposite to human compassion. Thus, virtues should be extended to all species and not just humans as part of moral extensionism. Switching to LGM prevents the need to kill animals, which reduces the amount of animal suffering required to produce meat. From an act utilitarian standpoint, the amount of happiness is increased as non-human animal (NHA) suffering is avoided with LGM. The scientific consensus approach agrees that global warming is a crisis affecting all life on earth. Early feasibility studies predict that LGM has the potential to reduce current agricultural greenhouse gas emissions (GHG) by up to 95% (figure 1). The sustainability framework suggests that we have a ‘chain of obligation’ as actions taken by the current generation will affect the welfare of future generations. The pragmatic attitude accepts the use of LGM as a promising environmental technology for its potential ability to reduce GHGs and combat climate change. Is it a big mis-steak? LGM is acknowledged as having the potential to reduce GHG emissions and resource usage compared to conventional farming. The key word is POTENTIAL! Some early feasibility studies contrarily claim that LGM may actually have the opposite environmental effect than intended. From figure 1, the CO2 emitted from LGM has a longer atmospheric lifespan than CH4 emitted from current agriculture. Scientific models have predicted that in the short term LGM is environmentally better than conventional farming. Over time, LGM may result in a higher warming effect as CO2 accumulates compared to the short lifespan of agricultural GHG emissions (CH4). Taking heed of the precautionary principle, perhaps we should not implement a technology that has substantial uncertainty over its environmental credentials. Furthermore, society’s hedonistic desire for choice and autonomy could result in LGM merely sitting beside conventional farmed meat. Therefore, adding to the problem of extra GHG rather than displacing the previous technology. A consequentialist approach in tandem with the precautionary principle suggests avoiding LGM as it may emit more GHG, therefore exacerbating climate change. Pragmatic ethics suggest that it is better to shift to a vegetarian diet which has the lowest carbon footprint out of all dietary lifestyles compared to transitioning to another higher GHG emitting meat based option. In addition, rule utilitarianism suggests to benefit the most amount of people but is also concerned with fairness hence valuing justice to farmers in regards to potential job losses and bringing benefits at the same time. Growing LGM can be seen as reinforcing speciesist attitudes between humans and animals with humans at the top of the hierarchy allowed to ‘play god’ with lower status animals. Throughout history, core principles of religious frameworks such as Ahimsa in Hinduism have stressed the importance of man’s respect for nature. The ‘unnatural’ harvesting of lower status organisms for hedonistic desire is seen to deprive these animals of their dignity, fundamentally changing our relationship with them. LGM disregards care ethics as harvesting and consuming NHA meat is incompatible with our moral duty to care for sentient beings. The logical conclusion to disprove hierarchal speciesism is for us to grow human meat alongside animal meat. Ethically, victimless cannibalism sidesteps consequentialist arguments as the perceived outcome is positive in that it does not require murder. Furthermore, deontological concerns regarding duty of respect for the corpse and the deceased families are bypassed as there is no corpse desecration. So why should we not grow human meat? Society’s moral repugnance to cannibalism, even if victimless, can be justified through virtue ethics. Surely honourable virtuous people do not recreationally eat meat of their own kin? This results in an ethical conundrum as the usage of solely animal LGM is unjustified through animal ethics. Attempts to remove speciesism and align animal ethics with LGM come into conflict with virtue ethics surrounding human sanctity and moral character. Applying sustainability ethics and a climate reductionist approach, which built on prior ethical reasoning, we believe implementing LGM is the right thing to do. I’m pretty wary of lab grown meat as there are enough scandals with conventional meat already. Companies love to cut corners and cut costs. I feel that lab-grown meat is more open to abuse than conventional meat with its laboratory based approach. Even with heavy regulation I don’t think could get on board with it. No, I would definitely not eat a lab-grown burger. This is ridiculous because we are now so far away from natural foods and have very little idea as to what all of our processed, modified “foods” are doing to our bodies. A lab-grown burger would, in all honestly, freak me out completely. I try to eat as healthily as I can, and my idea of healthy food is proper natural food and definetly not lab grown food. The technology is not mature and who knows if it will cause diseases for the consumers and even worse cancer. Yes, Climate change With increased prosperity, people are consuming more and more meat products every year. In 2017 61,318,000,000 kg of beef were produced. Scientists have predicted that meat production and consumption is going to double in the next century. A Japanese study shows that for every kilogram of beef that is produced 36.4 kg of carbon dioxide is released into the earth’s atmosphere. This means that in 2017 there was 2,231,975,200,000 kg of carbon dioxide released. A Dutch scientist released a solution to the climate change problem. In 2013 the first ever lab grown ‘beef burger’ was produced. Over the years many scientists have worked together to make lab grown meat and have predicted that lab grown meat can reduce global warming. Lab grown meat, otherwise known as cultured meat, is meat that is cell cultured grown and not produced by animals. Scientists have come to the realisation that by utilising cell culture techniques it could grow muscle cells that produce lab grown meat. Memphis Meats and Mosa Meats predict that lab grown meat will be sold worldwide in 2020. There are underlying facts and figures for advancing towards LGM and these create a clear divide in the population for and against LGM, but the real question which we should ask ourselves is will LGM act as a substitute or a replacement? Do you think it will completely replace meat or just be an alternative? Very appealing article! Information is on point and provoking point of view! Easy to read and understand. Really agree on your points, and as far as I am aware it would be a groundbreaking alternative. Factory farming is organised cruelty in the direction of animals. This variety of abuse in the direction of these animals would no longer be frequent in society if it had been done to our pets such as puppies and cats. There are a lot of health troubles tied to manufacturing unit farming. The USDA reports that animals in the US meat industry produce sixty one million tons of waste each year, which is one hundred thirty instances the extent of human waste – or five tons for every US citizen. The USDA reviews that animals in the US meat enterprise produce sixty one million heaps of waste each year, which is a hundred thirty instances the volume of human waste – or five tons for every US citizen. Just imagine the health ramifications this can have on your health. But aside from all this we don’t want this a good deal meat in our weight-reduction plan its now not desirable for us. Indian”s have the lowest meat consumption in the world in accordance to UN FAO statistics. As of the 2006 Hindu-CNN-IBN State of the Nation Survey, reviews that over 31% (350 million people) are vegetarians and some other 9% are vegetarians that eat eggs. A lot of environmental problems are induced from manufacturing unit farming. As the demand for animal merchandise grows extra sources like water power plants and land need to be used to gasoline this demand. You have raised a good point in your article and I agree with your opinions! I loved this article especially the puns, it was a very interesting read! Lab grown meat seems like an ideal way to help the environment, and reduce the number of animals being slaughtered for food, and perhaps even reduce rates of factory farming. So as a vegetarian I would vouch for this idea if will help our planet in becoming more sustainable. However I can see why people who do consume meat may be against it as it is synthesized meat, and not from the main source which may be off putting. Overall, it was a really good read, and I would agree upon the points raised! Meat is a big part of society within British culture – whether it be bangers and mash or chicken korma. It is also clear that a reduced meat diet would help towards combating climate change and reducing animal cruelty, this is where we can find the issue. People want to reduce climate change and stop animal cruelty but only when the change is easier enough to have only a small impact on their own lifestyle. I often find myself wanting to go vegetarian but I do not wish to give up chicken or other meats I enjoy, this is why I believe that LGM can have a positive impact on our lifestyles. Although in its infancy, it will be intriguing to see what the future holds. I wasn’t aware however of the differing lifespans of the bi-products, with C02 lasting four times longer the cumulative effect needs to be considered. On a side note, religion within the topic could cause issues – genetically speaking a piece of beef is the same whether grown in a lab or from livestock – should this mean that someone who cannot eat beef from livestock can now eat LGM. I personally see this as the future alternative for livestock, but one which needs regulation and further study into its benefits. I must say, as far as interesting articles about beef go, this was well-done and really exceeded my eggspectations. I don’t think I could have written a better one if I fried and the puns were absolutely a-maize-ing. On a serious note, this really tuned my attention to the ethics of meat consumption from an environmental point of view as well as an ethical one. I, as well as most of the fine commenters on this article, was also unaware that lab-grown meat could be more damaging for the environment in the long term than traditionally-reared meat. The points you made were nicely backed up with lots of evidence and this is a topic that should definitely be in the public eye more. Really great job addressing that issue. I believe you have included a variety of both advantages and disadvantages for this current challenge. 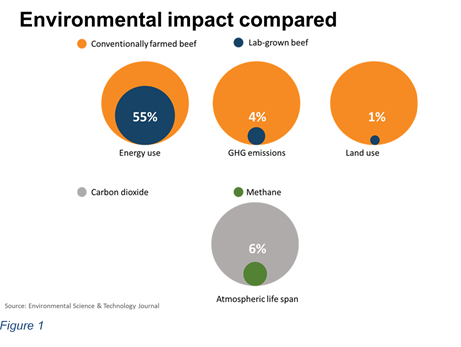 It is a well known fact, that the production of meat has a significant impact on the environment, primarily due to the production of methane throughout the process, which is one of the worst greenhouse gases. Also, the fact that the slaughtering of animals is considered as an unacceptable act by some religions and ideologists (e.g vegans) makes this a more pressing issue and increases the demand for an alternative method of producing meat. For these reasons, I believe your initial decision for implementing lab grown meat and also developing more the technology available to achieve this for the future is correct. An interesting, well written article with some eye-opening statistics. While I agree that it is beneficial to move away from natural meat by killing so many animals, more research should be done in the area relating to whether or not more GHG will be emitted in the long run before any steps are taken to implement this method. This is obviously a timely process and conflicting views should be investigated; the concept of eating lab-grown food is off-putting personally, and evidence showing no detrimental effects from such foods would be required to sway opinions on the matter. Nonetheless, I agree it is a topic that should be tackled and hopefully in the future, becomes a source that is accessible and used. As mentioned in the article, I strongly believe climate change is the biggest threat facing the majority of life on earth. Climate change is a multifaceted problem which no-one technology is likely to solve. I think lab grown meat is a sensible solution to address the issue of agriculture emission; land usage and deforestation linked to agriculture. Of course, it is preferable to go vegan but how likely are people to switch overnight. I think people need to weaned off conventional meat somehow and lab grown meat is a good bridging step. Even if people do not go vegan lab grown meat is preferable especially if renewable energy is used to power the meat production. It is clear that a significant change away from our current process is essential. LGM seems like it has the potential to be a valid solution- helping to prevent the spread of a ‘superbug’ and helping the environment in the short run at least. However, the long run sustainability needs to be certain, along with consideration of how production will be regulated, in order for it to both appeal to the consumer and become the answer we need to tackle climate change. Not enough thought has been given to the practicalities of LGM. As an idea it ticks most boxes – more environmentally friendly, more ethical and morally fulfilling etc. But as a practical food product made available for commercial manufacturing and public sale it hits a number of snags. As a new kind of product it will have to undergo a lengthy process of standards and procedural checks and regulatory procedures – if tied into EU agricultural specifications and the FSA this could take years, especially as it is an entirely new kind of food product. These checks will not only concern the food development process but technicalities such as specific product labelling, nutritional content specifications and will, as silly as this sounds, have to be tested to be deemed safe for human consumption. There will also be a considerable opposition lobby, not least from farmers and the wider public. Government legislation, especially that which is tied in with EU and food regulatory bodies, is notoriously slow and rigorous – it is unlikely we will see any product of this nature for at least 10 years, and will, arguably, take a whole generation to become a normalised food product and begin to phase out regular meat products – which is when we will start to see the positives stated above. Really interesting article, as a vegetarian I don’t think I would ever eat any type of meat, even if it is lab grown, for principle reasons. But if they can make this a commercially viable option, I do like the idea of meat in the future potentially being grow in labs, as I think it will be more sustainable for both the planet and those people who cannot live without eating meat. I also like how this would be a humane approach to getting meat, minimising the suffering of animals caused by us. I agree with @ganga, as a vegan I probably wouldn’t buy lab grown meat as there are still ethical issues. However I think this article is important in getting people to consider the ethical and environmental impact of the meat industry. Being vegetarian/vegan may be a better option overall, however they aren’t always a realistic option for everyone. Lab grown meat provides more of a middle ground for people looking to reduce their environmental impact and eat more ethically. Very interesting article into a clearly current and important issue in today’s world. Shifting away from solely a meat diet is an “essential” when it comes to avoiding climate breakdown. I don’t think LGM is quite the solution just yet as it is only a short-term improvement in terms of tackling climate change, as stated in the article, and potentially may exacerbate the problem of global warming in the long run. Sustainability (i.e. long run ability to maintain) must be the main objective when it comes to alternatives to meat. Although vegetarianism and veganism are clearly the best option to reduce meat consumption, as a meat eater myself, I think meat has become too integrated into people’s lifestyle for this to be the black and white solution to this matter. LGM research is a step in the right direction as it raising the climate issue and offering potential solutions, which can be seen as a realistic movement away from meat consumption, even if there are large cons at the moment. Provided it was proven that LGM could reduce carbon emissions by a worthwhile amount, it shouldn’t be too controversial. It would also rely on the meat grown lacking sentience, which I’m assuming would be the case. The primary issue that might be faced is moral dumbfounding, where people don’t like things but cannot articulate why – this would be especially true of human meat grown in labs. A very well written and thought out article! My main comment would be that it, whilst it did do a nice job of grasping a variety of different philosophical responses to the question of lab grown meat, I did feel that it should have focused on fewer philosophical concepts and in more detail. These concepts are multilayered and wouldn’t always necessarily produce the viewpoints that you say they would. As an example, rule utilitarianism is the general concept that by following certain rules we can generate the greatest utility. This concept may lead to the rule you suggest that protecting farmers as well as the environment will produce the greatest utility overall, but it may equally be found that a different rule from the one you suggested generates the greatest utility. My point is I feel you have slightly undersold a lot of complex philosophy, and the article would have benefited from fewer concepts examined more in depth. To clarify my above comment, as a philosophy student I feel the article does a really impressive job of capturing a wide variety of philosophical concepts and applying them to the engineering arena, showing real potential for debate. My only comment was that the arguments show great potential and I hope there is opportunity for these to really be dug into in further articles or debate. Very strong ethical reasoning for both sides of the argument. I’m in favour of lab-grown meat because of the potential contributions it can make in reducing greenhouse gas emissions. However, another part of me baulks at the idea of eating something that was grown in the lab. I agree with the article. Even if LGM does have problems those problems don’t outweigh the prospect of famine or climate disaster that are far more likely under our current lifestyle choices. Provided LGM’s are properly tested and regulated I think they provide a important step in dealing with the issues of climate change and it definitely should be explored further. Release Hands, Are We Ready Yet?